Space Interview - Universe Galaxies And Stars Section. 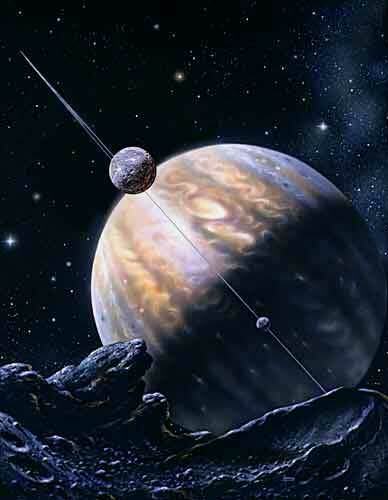 Space - Interview with David A. Hardy. Space - planet in a globular cluster. Futures: 50 Years in Space, The Challenge of the Stars, a superb new art book/astronomy guide by David A Hardy and Sir Patrick Moore was published in May 2004 (read the universe Today review here). David took some time out of his busy schedule to talk with Richard Pearson about his passion for both art and space, and his long-lasting friendship and working relationship with Sir Patrick Moore. There are few people who have astronomical bodies named after them in recognition of their hard work over the years, so TV Astronomer Sir Patrick Moore and space artist David A. Hardy are true space companions: both have asteroids named after them. Their friendship goes back half a decade. "In almost all of the books that Patrick and I have done together, he gives me a free hand - he knows that I have a good knowledge of astronomy etc., and has complete confidence in my ability (especially, after 50 years!). In the early days, if he wrote the text first, he sent it to me or we would meet to discuss which parts needed illustrating and how. But in the case of Futures - you'll notice that my name appears first on the cover - the choice of subjects and illustrations were mine. Patrick approved them, and then wrote the text. In many cases, I wrote some notes of my own first, which he then incorporated. As his health allows him to type only slowly and inaccurately now (on his 1908 Woodstock), he sent me the typescript, which I passed to my wife Ruth to transcribe into Word on her Mac, and I then emailed it to the publisher." Both Sir Patrick and David A. Hardy have been keen artists in their own respect. Patrick has a talent for writing clear concise books and features on astronomy, and he's presented the BBCs "The Sky at Night" program every month for more than 48 years. He began as a school teacher, and humbled by his mother's artistic talent for colourful drawings of sweet looking aliens canoing down a Martian canal or driving a car around on the rings of Saturn, Sir Patrick took to writing books and continues writing today. They're both in a good position to have watched Space exploration change over the last half century, participating in and popularizing the many discoveries that have been made. So what is the better approach, making an alien looking world or making the detail as accurate as possible? "Where possible, I try to do both. But remember that this is astronomical art, not science fiction, and in a book like this I would not include anything that is not accurate according to current knowledge, or at least scientifically possible. This means that paintings done in the 1950s or 60s showing, say, Mars or Titan with a blue sky were accurate for our state of knowledge at the time. Where I have included alien life or signs of civilization, it is based on scientific extrapolation. My favourite of these is the alien life on a planet in a globular cluster (page 99 in Futures: 50 Years in Space), as I believe the idea to be quite original: a type of photosynthesis producing oxygen inside balloon-like organisms, which then float in a carbon dioxide atmosphere. "I think my paintings, whether traditional or digital, are pretty realistic, aren't they? I don't see any need to go as far as super-realism, as that can lead to rather bland art with little character or emotion. I have painted in the styles of Mondrian, Pollock, Picasso on occasion, but only for special commissions. Romanticism, yes - the painting of Antares (page 80) was, as stated, painted deliberately in the style of the Hudson River School of artists. I've seen some of those (often huge) originals while in the USA, and love them! I hope that the work of space artists can help to inspire the public to further exploration, just as those artists did in the great days of the opening up of the US West, which in turn led to the creation of National Parks, like Yellowstone and Yosemite." The planet Saturn with its rings is now becoming visible again after its period of invisibility in the eastern sky, and is certainly at the centre of attention right now as Cassini continues to send back "postcards"; most recently of the planet's largest Moon Titan. Yet some artists still paint Saturn inaccurately. "Saturn is beautiful, with its rings, but views of Saturn from its moons in the media are almost always incorrect," explained David, "since they show Saturn with the rings wide open, whereas from all but one of the satellites (Iapetus) the rings appear as a straight line." When asked what about his favorite planet, David said, "I suppose I would have to say that my favorite is Mars. I'd need time to think about the second part, but I would comment that on a frivolous note I thought of Michael Jackson, whose face has surely changed as many times as that of Mars over the years!" As we press on into 21st century, we have many more planetary close encounters awaiting us. And David A. Hardy and Sir Patrick Moore will be right there to help us get a sense of what it would be like to stand in distant places of the Universe, and appreciate how much is out there, waiting for us to discover. If you're interested in Futures: 50 Years in Space, please read Universe Today's review. 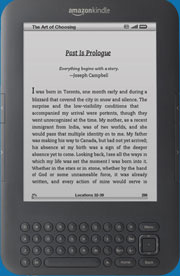 You can also visit Amazon.com to read more reviews, or purchase a copy online (or Amazon.co.uk). You can also visit David's website at http://www.astroart.org, or the BBC's website for Sir Patrick Moore's "The Sky at Night". David A. Hardy was interviewed by Richard Pearson.